June 3rd, 2013 (debut episode). Minute 1 of Star Wars. The 20th Century Fox Fanfare through the first paragraph of the opening crawl. Pete's and Alex's first viewings of Star Wars and watching movies in the 1970s. The moment of hushed silence in the theater just before the logo and opening fanfare plays. The Star Wars civil war. 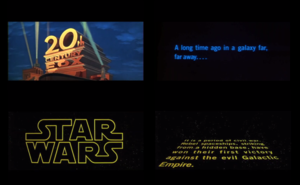 The meaning of the opening crawl and what it all means, especially to kids. No reference to Earth in these movies. The one and only use of the word spaceships in the movie (in the opening crawl). Basic layout of the podcast provided. Using the original version of the film for this podcast. Doing all three of the first sequel movies is discussed. The original Skype call—the raw audio that became this episode—was aired in its entirety on SWM:WE. Alex: I wrote down a couple of things: "It's a period of civil war." Pete: Oh, we're not there yet. Alex: Oh. I'm sorry. Pete: C'mon, we're not going to hang out on the weekends talking about Star Wars. This page was last modified on 18 November 2018, at 21:48.